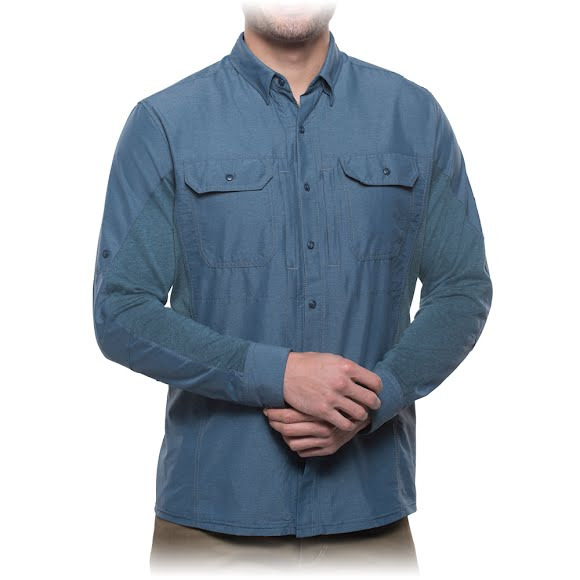 The KUHL AIRSPEED™ LS Shirt is a game changer. Hot sun, high humidity, and stifling air are no match for Kuhl's collection of AIRSPEED™ shirts with AirVolution™ fabric. The AIRSPEED LS™ features a button-down collar, button front, adjustable cuff and 2 button-down chest pockets. A zippered security pocket and a built-in custom sunglass cleaner is sewn inside the bottom left placket. The KUHL AIRSPEED™ LS Shirt is a game changer. Hot sun, high humidity, and stifling air are no match for Kuhl &apos;s collection of AIRSPEED™ shirts with AirVolution™ fabric. AirVolution™ AirVolution™ is a woven, technical nylon/poly blend that blocks the sun&apos;s harmful UV rays, wicks moisture and dries quickly. It feels like cotton against the skin but boasts all the performance of polyester. The Ultraviolet Protection Factor (UPF) rating system measures the UV protection provided by fabric. It is very similar to the SPF rating system used for sunscreens. A garment with a UPF of 50 only allows 1/50th of the UV radiation falling on the surface of the garment to pass through it. In other words, it blocks 49/50ths or 98% of the UV radiation.